1. "The Potter and The Clay" - This demo teaches the spiritual connection we have as clay, to God, the Master Potter. As you hear teaching from the scripture, along with demonstrations on the potter’s wheel, the understanding that we are God’s clay and He is the potter will come alive to you. You’ll see how we must be pliable clay in His hands, and how willingness to go through the fire, is a must to become the vessel He desires. Worship Pastor, Family of Faith Fellowship"
2. "Drum Making" - This presentation includes throwing the drum shell on the wheel in two large pieces, attaching those pieces, and showing already fired drum shells and component of drum heads, with explanation of how the heads are made and tightened. Ms. Harwood gave two demonstrations on how to throw a djembe drum on the wheel... attended by more than ninety students and faculty. Engaging and well received... we would highly recommend Ms. Harwood's demonstration as an educational, multidiscipline demonstration." Either of these demonstrations can be geared to groups large or small, young or adult. 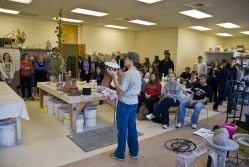 It can be as simple as a demonstration only, or include hands on workshops. I will tailor the event to the needs of your particular group. Cost of demonstration /workshop varies accordingly. Go to my contact page and send me an email if you are interested.